Perdido Key Area Chamber and Visit Pensacola to bring the eagerly awaited Snowbird Roost back to the Downtown Pensacola Area! PERDIDO KEY, FLA. January 15, 2019 – The 2019 Snowbird Season is officially upon us! 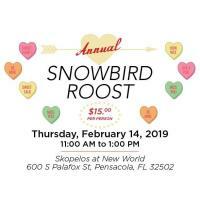 In order to welcome and celebrate the coming of our winter guests, the Perdido Key Area Chamber of Commerce along with Visit Pensacola is excited to announce the exclusive details of the Annual Snowbird Roost! Snowbirds from Perdido Key and Pensacola will be able to enjoy their Valentine’s Day exploring the amazing opportunities from local vendors in our area! On Thursday, February 14, 2019, from 11:30 am to 1:00 pm, Vendors will be excitedly waiting to meet the 2019 winter visitor crowd and send them off with some amazing goodies! We will once again be returning to Skopelos at New World Landing to be served a delicious plated lunch while enjoying a fun-filled program! The 2019 Snowbird Roost will be entirely themed for Valentines Day- which means games, sweets, entertainment and of course adoring décor! Admission for the event is only $15 per person. Tickets are limited and can be purchased in person at the Perdido Key Visitor’s Center located at 15500 Perdido Key Dr. Pensacola, FL 32507 or by calling 850-602-9279. Come experience the businesses and the essence of the Pensacola and Perdido Key Area at this treasured Snowbird experience!